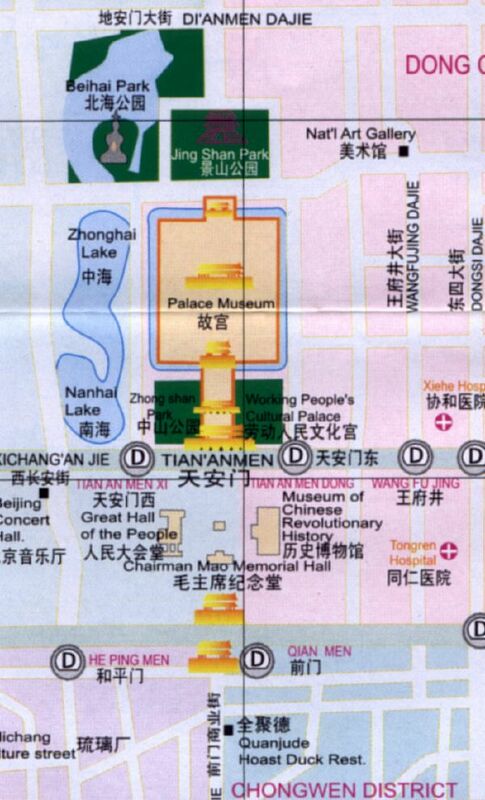 This map depicts the Greater Tian An men Square area and Forbidden City and surroundings, which are all part of the XiCheng and DongCheng District of Beijing City. This Map depicts the exact center of Beijing City and runs from Beihai Park and Dianmen Dajie' (street) in the North to Qianmen and Dashilan Street in the South. From West to East Zhongnanhai Leadership compound area inside the blue area of XiCheng District, and on the other side of the district border Wanfujing Major Shopping Street with Oriental Plaza inside pink colored DongCheng District are included. Compare Maps and Follow Links to more information and Photos !